It’s a huge no-no to use an artist’s work unless you have their permission. But sometimes you might want to use a piece of art as a background texture or as an accent piece in your project. Other people’s artwork has a place in creative work, but copyright is also very important. There are lots of advantages to using other artists’ images in your work, but you want to do it without infringing upon their rights. So where can you get royalty-free photos and art images to use in your own art, preferably from a free source? I’ll answer that question below with a list of websites you can use to find high-quality artwork that’s totally free to use in your own work, even commercially. The WikiMedia website contains over 48 million photos and pieces of art that you’re free to use for personal or commercial purposes. Anyone can contribute to this database by uploading their own images for others to use, which means there’s a lot, and we mean a LOT of stuff to choose from. Here you’ll find images of just about anything you can think of: people, vehicles, animals, architecture, landscapes from all over the world, furniture, clothing, nature, machinery, food, you name it. The site is simple to browse and really easy to search. Categories of images are divided by topics such as Nature, Society Culture, Science, and Engineering with subcategories for each, and you can search inside each category to limit your results. This site can be kind of a rabbit hole because there’s so much content, but you stand a good chance of finding just about anything you could ever want, from microscopic images of algae to rare stamps or pictures of people on the moon. The WikiMedia website alone might take care of all your creative commons image needs so be sure to bookmark it for later. The National Gallery of Art has made over 51,000 images from their collection available for free download for any use, both personal and commercial. 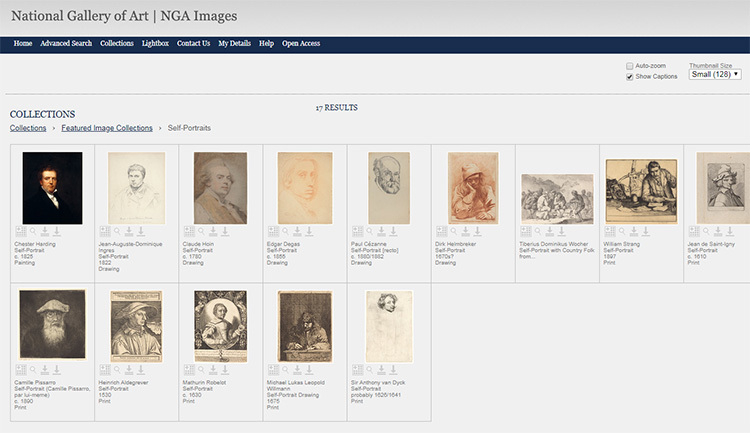 This database represents a sizable chunk of the gallery’s massive collection. Most of these images are high resolution(up to 4000 pixels) so they’re great for using in your own art and to copy for practice. You can find images of artwork representing many different time periods and subjects such as myths and legends, self-portraits, and famous historical events. You’ll also find iconic works by famous artists such as Vincent Van Gogh, Paul Cezanne, Claude Monet, and Edgar Degas. You can browse categories or find what you’re looking for with their advanced search tool so it’s pretty easy to find exactly what you’re looking for. Just keep in mind that most of these pieces are focused on realist art and classical paintings, so there isn’t a ton of modern art in here. Although if you search hard enough you might find something! Like the National Gallery, the Los Angeles County Museum of Art has made many images of their collection available to the public. All totally free to download, no royalties, all online. 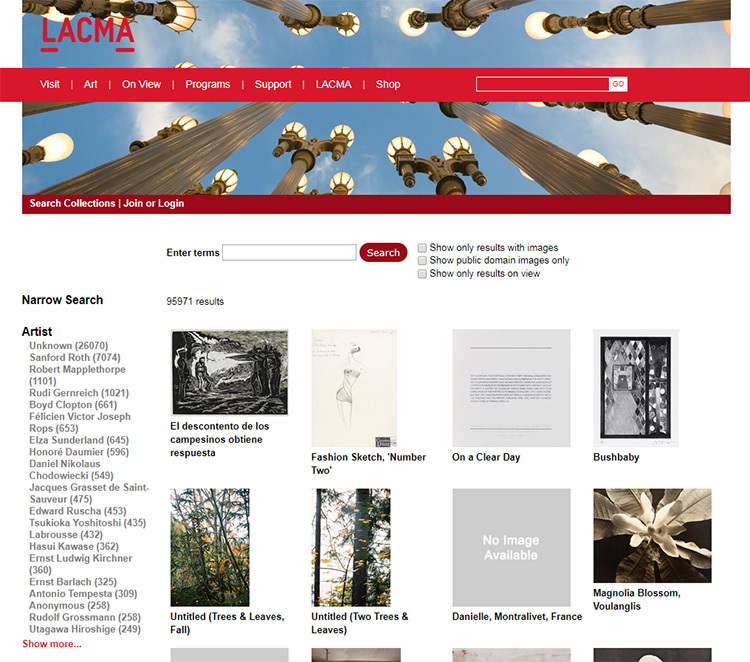 Their database boasts over 20,000 images of artworks from hundreds of time periods, movements, artists, and mediums. You’ll find high-res, high-quality images of all types of artwork: paintings, drawings, sculptures, statues, tapestries, books, illuminated manuscripts, jewelry, ceramics, furniture, tools, and lots more. Plenty of good stuff to inspire your own concepts and many images you may even use directly in your art! If you’ve ever been to the MET you know how massive it is. The collection is so vast that it’s impossible to see it all in a day, and that’s only with what they currently have on display! This doesn’t include the huge array of pieces in their storage vaults. The Metropolitan Museum of Art, one of the largest and most famous galleries in the world, has created an online database containing nearly 500,000 images of art pieces from their collection. In this database you’ll find images of paintings, sculptures, drawings, ancient artifacts from cultures all over the world, pottery, blown glass, jewelry, and even vintage match covers featuring classic film stars such as Fred Astaire and Elizabeth Bergner. Really this is a cultural time machine with a massive value to designers and artists. All of these images are easy to download and they’re royalty free so no worries about copyright issues. 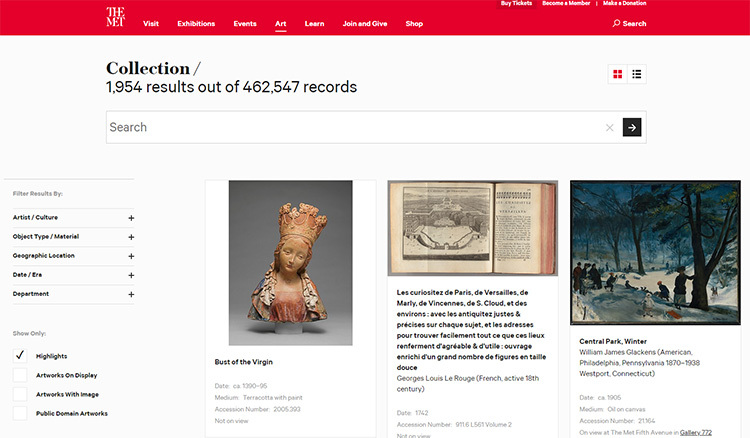 You can browse categories or search by artist, date, material, culture, or many other properties. This is the second best option to touring the museum itself, and you’re sure to find something to inspire you no matter what kind of art you’re looking for. First, go to Google Images and search for your subject. Then adjust the filters by going to Tools–>Usage Rights–>Labeled for Reuse. That way you’ll only see images that are labeled in the public domain, or licensed under the creative commons CC 2.0 and made available for private or commercial use. This way you can browse freely and use pretty much anything that turns up. Google is the king of search engines so if there’s a great royalty-free image out there, you better believe Google can find it. In fact, this trick works for any type of image even outside of artwork. Need a random photo of a toucan or a picture of someone laying grout? Check Google Images with the proper usage rights settings. This trick alone could fix your image copyright problems for good. And it should prove there are tons of places to get access to all the free images you need without violating copyright. Use these resources to get inspiration, build your artistic skills, teach others, and to enhance your own creative work!